Zaid Hussein climbed into the dusty front seat of the armored truck, beside a shabbily dressed middle-aged man at the wheel. Hardly had he settled himself when the truck stuttered forward once more, leaving behind clouds of sand in its wake. It was in the dead of the night when the first American drones descended upon Iraq, forever shattering the tranquility of the country. Zaid Hussein, staying with his wife and two daughters in a village on the outskirts of Baghdad, was one of thousands ordered to join the militant regime. Going from an agriculturist to a militant – from a spade to a gun – Hussein couldn’t have been unhappier to leave his family and his village. But an order was an order, and Hussein was in no position to refuse. Situations had changed, and Hussein futilely searched within himself for a ruthlessness that had never existed. It wasn’t the tough conditions of the militant camps that got to him; the battle with his own conscience was a far greater deterrent. That very morning, a sudden airstrike had engulfed Baghdad. American planes threateningly circled the stormy skies, bringing with them the powerful missiles of a country thousands of miles away. No sooner had the first missile struck than Hussein began scourging the streets, sacrificing his own body to help his Iraqi countrymen. Screaming at the top of his voice, Hussein caught men and women by their arms and shepherded them toward indoor shelters where the airstrikes could not reach them. In the midst of this mayhem, one of the aircraft bullets had found its target. The pain was splitting, but Hussein struggled on, only resting after he had taken a child safely indoors. And then, just as suddenly as the airstrikes had begun, they subsided. The aftermath was heart-wrenching – disembodied limbs strewn haphazardly on the streets, bloodied mothers with their crying infants in their arms, families broken apart by the single push of a button …. Families … Hussein jerked involuntarily in his seat. It was all down to the weight of that one word that Hussein had decided, then and there, to flee from Baghdad. “Are you alright, friend? Is there anything I can do?” The scruffy, but worried tone of his companion brought him back to the present. “Yes … Yes, I’m fine. Just take me outside Baghdad,” he said, wincing as the truck hit another bump on the road. The question startled Hussein. His heart sank as he realized that as long as he was still wearing his familiar military uniform, he couldn’t escape to his village. He would have to continue behaving like a militant for now. To Hussein, the pain of the wound was incomparable to the pain of not knowing whether his family was safe or not. He craved to see his wife once more – his beautiful, supportive wife. She had been silently against his departure, but she knew that the country needed him. And then, there was his four-year old daughter. The idea of war was beyond her. To her, her Baba was going on a trip, and would return soon. At least, that was what Hussein had told her. He wished for it to become true as much as she did. Hussein ran his left hand through his hair, while he clutched his thigh with his right hand. “What are you doing, driving a truck in times as troubled as these?” he said, asking the question which had been playing on his mind since the beginning of the ride. “Well … See those crates stashed at the back?” Jamail said, pointing towards the back of the truck. Silence. Hussein was stunned to the hilt; here he was, fleeing from a militant camp, and he had hitched a ride with the very person who supplies weapons to these camps. Jamail would surely not settle for anything less than dropping him right inside the Baqubah camp. “Why are you so taken aback?” Jamail asked, charily. Hussein swallowed nervously. Jamail looked at him, and then guffawed. Hussein, momentarily reassured, looked outside the window. They were fast approaching his village. Though he hated to admit it, Hussein was slowly coming to grips with the fact that the trapdoor of his escape had been forced shut on him. He couldn’t give Jamail the slip, and now it was too late for him to pretend to be someone else. Yet, Hussein infinitely preferred to meet his family this one time, than not at all. He couldn’t allow himself the comfort of thinking he would escape again; the terrible facet to being a militant was that Hussein had to prepare himself for each meeting as if it were his last. “There, that’s my village!” said Hussein, pointing forward. He immediately looked for any tell-tale signs of any wrongdoings; he delighted in the fact that there were none. Smoke curled out from the chimneys of the households, men stood hunched in their fields, taking care of their crops, and children ran about in the streets. The truck slowly skidded to a halt, in front of a house indicated by Hussein. He climbed out as fast as his wounded leg would allow him, and shouted out loudly to his wife and daughter. The door opened slightly, and a face peeked out – a disbelieving, skeptical face, which quickly transformed into one resplendent with joy. The door was thrown open. Hussein’s wife and daughter came running out and threw their arms around his neck, weeping with ecstasy. “My loved ones, don’t cry… We’re all safe, and that’s what matters. I’ve decided to give my life to protect Iraq, the people in Baghdad need my services more than any field would. Shhh, Tanya, don’t cry, Baba will be back soon, sooner than you know… no love, I can’t stay for long, my friend is waiting fo –” Hussein turned around. But the truck was gone. A small distance away from Hussein’s village, Jamail Sheikh smiled to himself. He worked for a living by transporting guns to militant camps, and he knew a militant when he saw one. Zaid Hussein could never be one. Mohit Mandal is a first-year student at NYU Abu Dhabi. 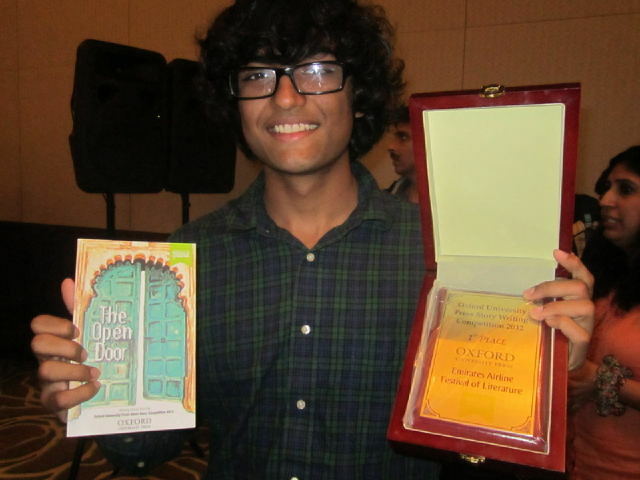 This story was awarded first place in the Oxford University Press Story Writing Competition, part of the 2012 Emirates Airline Festival of Literature, held in last March in Dubai. Next week: Award-winning poems from the festival by NYUAD students.